Protesters brandish signs saying police are 'murdering' members of the Ethiopian community, following shooting death of Ethiopian man. 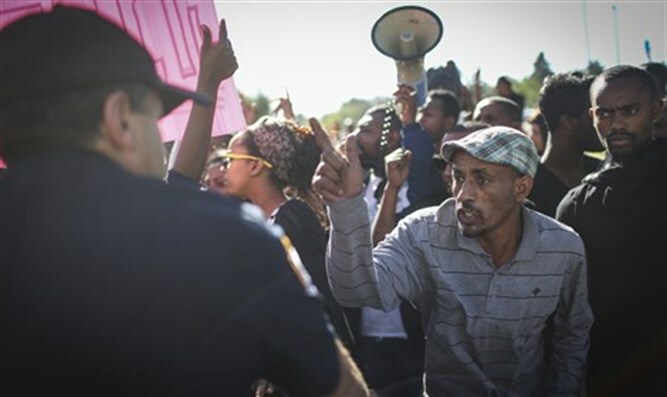 Members of the Ethiopian community in Israel protested Wednesday against what they believe is police violence against their community. The protest was held in Tel Aviv following the death of 24-year-old Yehuda Biadga, who was shot by a policeman in Bat Yam two weeks ago. The demonstrators carried Israeli flags and signs reading: "Police are murdering Beta Israel," "the police cover-up department," and "police state." MK Ilan Gilon (Meretz), chairman of the lobby against police violence in the Knesset, said at the protest: "The police have only one role: to maintain public order and protect the citizens, not the other way around." "The first protest that took place in 2015, and the Palmur Report published since then, were supposed to bring about a change, but this is not the case. We still see that the culture of whitewashing, silence, denial, and insensitivity of the police, which refuses to examine itself and its function time after time, persists and therefore I, we, are here to stand against violence and racism, for equality, solidarity and justice," Gilon said.